Stunning Keisha: Are You Up To A Challenge? Now that the Cat Ruler of the World Contest has finished, I was all set to get back to the business of MY life but that will have to wait another day or two. Seems this week Petfinder.com is having their annual "harder to adopt out" pets week. I refuse to use their title of Adopt-A-Less-Adoptble-Pet Week because it's just so demeaning to these pets. This gives me the opportunity to tie three items together under one giant umbrella. I'm up to the challenge. Are you? Brooke's Legacy Animal Rescue is one of my favorite charities even though I don't live in Florida. One reason is that my Auntie Karen volunteers and fosters for them. Another is that they're all about giving second chances to pets who are about to be euthanized. The rescue is named after Brooke Ashley Miller, who was killed in an automobile accident on her 18th birthday. Brooke loved animals so this great organization honors her by giving animals the second chance at life that she never got. I'm going to innerduce you to a few of the harder to adopt pets their volunteers are currently fostering. Then I'm going to tell you how to make their lives much better even if you can't adopt. It's even easier than it sounds. Look at these sweet faces. Starting at the top right and going counterclockwise meet Uri (sweet little male Chihuahua who's deaf), you know my frosted cousin Traffic who's doing great on 3 legs, Fancy May ("Can I please get a forever home of my own. "), shy Little Star, Marcia Leah (a Cockapoo on meds), Mr. Fuzzy Lumpkins (cloudy eye from an old injury), 2-year-old American Staffordshire Terrier mix Addie, Marathon (Beagle/Rat Terrier mix) and Hansa Rose who actually has 2 eyes but 1 is set way back. 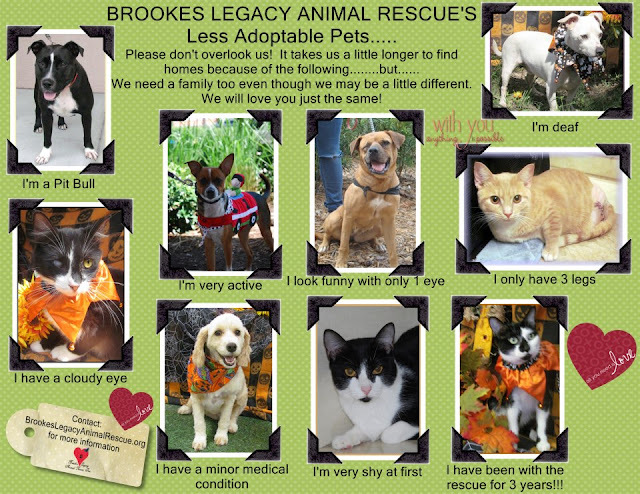 These babies are all available for adoption at Brookes Legacy Animal Rescue in Naples, FL. Right now, the cover boy on their web site is my cousin Fluffbomb! He's a star just like me! They're having a big College Football Tailgating Adoption Event this Saturday at the Petco Naples at Airport Road & Naples Blvd from 11-3. If you don't live in Florida, there's another way to help these pets and that's with a simple mouse click. If you're on Facebook, please vote for Brookes Legacy Animal Rescue every day in the Petco Foundation's 100 Celebrations contest so they can win a grant of $10,000. This grant will be used to help fund our medical costs for adoptable pets they save from the kill shelters that's would have been euthanized otherwise because of needing special medical attention. They have many of the ones that no one else will. It will also help with their spay/neuter surgeries to cut down on the staggering pet overpopulation. Click anywhere in this paragraph to go to Facebook.com and like the Petco Foundation page. Then go to 100 Celebrations Contest. click on "Vote to Save Lives" and then go to page 2 to vote for Brookes Legacy. Please vote every day through noon EDT October 5, 2012. You can also like the Brookes Legacy Animal Rescue's page on Facebook and follow the links there. 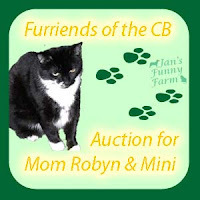 Only 3 1/2 days left in the CB Auction for Mini. Mini is a black tuxie and we're all heard that black cats are harder to adopt out then other colors. She has a home with the Hotties but there are lots of black cats looking for homes. Back to the auction: they've added some really wonderful items including a $25 gift certificate to Nip & Bones and a lovely copper pendant and black bead necklace and earrings from Kruse Kats. Their Mom, Wanda, makes those gorgeous quilts and she also does bead work. The sale ends Sunday , September 23rd. Start your Holiday shopping early and get some fantastic deals that aren't available in any store. We're on the case, CK!!! Be sure to keep reminding us (Glogirly) so that we (Glogirly) don't forget (Glogirly) to vote! Harder to adopt is less demeaning. That rescue looks like a great place, and I hope those babies all get their forever homes soon! Brookes popped up right away...I didn't have to do all of that stuff...I voted! CK, you do so much hard work for charities. You are such a generous ghetto kitty. If my mom was a cat, she'd be in the "less adoptable category" because of her bad eye. It's important to focus on the personality and goodness of the pet, not merely their looks. Mom says she would adopt ALL these pets if she could! Bless you for giving so much of your time. Luv you! Thank you so much for giving the rescue that is dear to my meowmie's heart a shout out!!! We love you! Remember to please vote every day until October 5th. Thank you everyone. This is the rescue that my meowmie found me. All my furrends will find homes, it is just taking a little longer with some. I have litterbox issues but I ended up in paradise just the same. We will go vote right now! Thanks for the info. I'll have to go vote! Or at least my human will. BTW, I don't like the "less adoptable" moniker either, and my blog post today is all about that. We voted, CK! But we have to remember to vote again and again! I am going to get on Mom to convince her of the benefits of at least getting a facebook page so we could help with votes so we can help supporting this organization with votes. Liked and sharing all over. Someday, and that day had best come soon, I am going to insist on a facebook page. I feel sooooo....20th century. Great post and we wish them well and good luck in finding forever homes. Have a fabulous Friday. Miss CK, you are a true princess. Thank you for looking out for these little ones. Yes, we will vote too :) But will need reminding also as the human is very old and a bit thick!!! I will head that way in just a bit. I love groups like that! We'll be voting, too, and as soon as we're finally settled, we'll probably find ourselves another woofie to love. Special situations never stopped us before and won't now. Angel Trapper came from Golden Rescue and all the kitties we've ever had have come from shelters or foster homes.